Frankincense to remove skin warts and moles can work well. This herb has been in use for centuries as a cure or treatment for various conditions, including several skin conditions. 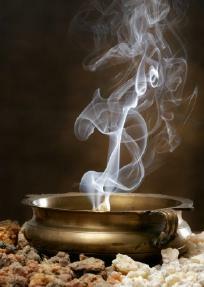 Frankincense was a valuable resource in ancient cultures because of its healing ability. The early Egyptians used it during the embalming process because it was the belief that it would help to preserve the body, especially the skin. The Greek culture used frankincense to remedy hemlock poisoning. The Chinese readily used it for various skin ailments and internal treatments, as they did for other herbal remedies. Although frankincense has been used internally for various ancient remedies, it is no longer used in that way. Rather, it is used as a topical treatment for skin conditions. It can also be used as a vapor for treating respiratory ailments. Because of its topical abilities, frankincense is an excellent treatment for skin warts. Purchase frankincense oils to use for this particular treatment. Clean the area well. Allow to dry. Apply a drop of frankincense oil directly on the skin wart or mole. Cover with a large bandage that is absorbent enough to absorb and hold the frankincense against the mole. Reapply a drop of frankincense two times per week. Change the bandage each day. To enhance this remedy, try to eat a diet that will boost the immune system and fight off the skin wart. This includes a diet rich in cabbage, garlic, limes, broccoli, oranges and bananas. Another method for using frankincense for skin warts requires the application of frankincense to the area two times per day. Leave the skin exposed rather than covered with a bandage. 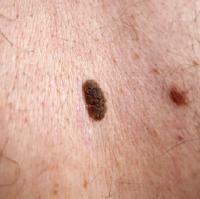 After two weeks, the mole or the skin wart should fall off painlessly. Add this to a hot bath daily. The frankincense oil is just enough to react with the skin moles and, over time, it will get rid of them. Another option is to apply two drops of oregano essential oil on the mole. Do this one or two times per day. The mole will turn black and within a few days, it will fall off. Once it falls off, apply a drop of frankincense and lavender to the new skin. This will help to prevent scarring from the mole. Frankincense may also be applied directly to the mole one or two times per day over a period of two weeks. The mole should blacken and fall off. Continue to apply the frankincense for several days after the mole is gone to prevent the skin from scarring. Use frankincense to remove skin warts and moles on a regular basis. However, this is not all this essential oil can do for the skin or for overall health. Although most scientific research is still pending, frankincense is often claimed as a cure all for topical applications. It can be used to treat any of the following conditions. Anxiety or Emotional Fatigue: Use frankincense in aromatherapy to create a soft mist. This fragrant mixture can help to relieve anxiety, emotional fatigue and hysteria. Those who do not like the smell of frankincense can add lavender essential oil to the therapy. Congestion and Cold Symptoms: Use frankincense as a topical application to the chest as a way to relieve congestion and other cold systems. Just one or two drops can be applied to the upper chest and then rubbed into the skin. Anti Inflammatory: Most skin infections be treatmented with frankincense. It can also be used to treat internal inflammation by using an aromatherapy approach.